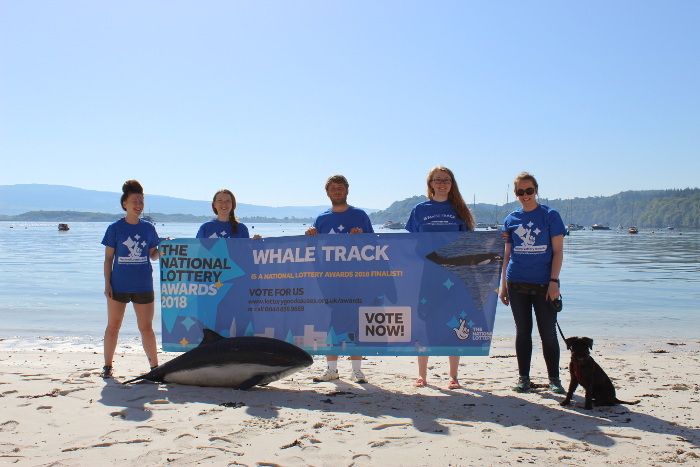 Home » Whale Track named as finalist in National Lottery Awards! We’re excited to announce that Whale Track, developed by Hebridean Whale and Dolphin Trust, has been named as a finalist in the 2018 National Lottery Awards – the annual search for people’s favourite National Lottery-funded projects – and your vote can help it win! Whale Track, a first-of-its-kind smartphone app that allows anyone to submit marine mammal sightings off the west coast of Scotland, is competing in the Best Environment project category. Whale Track uses the technology we all carry in our pockets to quickly and easily record sightings of marine mammals in the Hebrides. Rather than simply educating, the project actively involves people in tracking the movements of coastal species like bottlenose dolphins and unravelling the mysteries of more elusive species like killer whales, helping everyone become ‘citizen scientists’. Whale Track is free to download and uses GPS to accurately track excursions at sea and record locations of sightings. Crucially, the app works without phone signal or Wi-Fi, meaning sightings can be recorded in the most remote areas. Since its launch in August 2017, the uptake of Whale Track has been incredible. With now over 500 users, over 2,500 sightings, and over 250 excursions, 15,000 animals have been recorded so far, including common dolphin super pods recorded from aircraft, and multiple records of John Coe (the most famous member of the UK’s last remaining killer whale pod). The project beat stiff competition from over 700 organisations to reach the public voting stage in this year’s National Lottery Awards, which celebrate the inspirational people and projects who do extraordinary things with National Lottery funding. The project with the most votes will be crowned the winner and receive a £5,000 cash prize to spend on their project, an iconic National Lottery Awards trophy and attend a star-studded glittering awards ceremony to be broadcast on BBC One on 26 September 2018.